Anzac Day is celebrated in Australia and New Zealand on April 25. That is the anniversary of the landing on Gallipoli in 1915 during WW1, but nowadays we also remember and pay homage to the people who have died in all wars to protect us. (* I am now spelling Anzac NOT in all caps as I’ve realised what I was taught is probably incorrect, unless I write specifically about the army corps.) We also encourage children to think about the effects of war on people everywhere. If you’re a parent, teacher or librarian looking for resources to support investigating Anzac Day with kids, check out these first five recently published books that others and I have reviewed, earlier reviews, and then a list of other useful web resources, below. Once a Shepherd by Glenda Millard and Phil Lesnie, was published by Walker Books Australia, 2014. From the publisher: Rhyming, poignant verse from award-winning author Glenda Millard is coupled with warm illustrations from newcomer Phil Lesnie. Makes personal the backstory of soldiers who fought in WWI. A moving tale that will help grandparents connect personal experiences of war with young children. This is a beautiful children’s picture book, guaranteed to bring tears to many eyes. Millard is a natural poet and storyteller who could make a bus timetable sing. She uses a non-traditional rhyming scheme in Once a Shepherd to weave a tale about a young shepherd who must leave his wife and unborn child to go off to war. The wife makes him a coat which is returned to her after his death, and she is able to create a toy for her son from it. I loved Lesnie’s watercolour illustrations. They are so evocative, transmitting intense emotion. Just as Millard weaves, so too does Lesnie with details like the little boy’s flower garland echoing the strands of barbed wire in the picture of the trenches. I hope to see more of Lesnie’s art work in future books. While the publisher rates it for 5+, I think children will understand Once a Shepherd best if they are 7+. I would definitely recommend it to libraries buying resources to support Anzac Day, but it’s also an excellent choice for adults who want a book that encourages young people to think about the big themes: life/death, war/peace, love/loss. 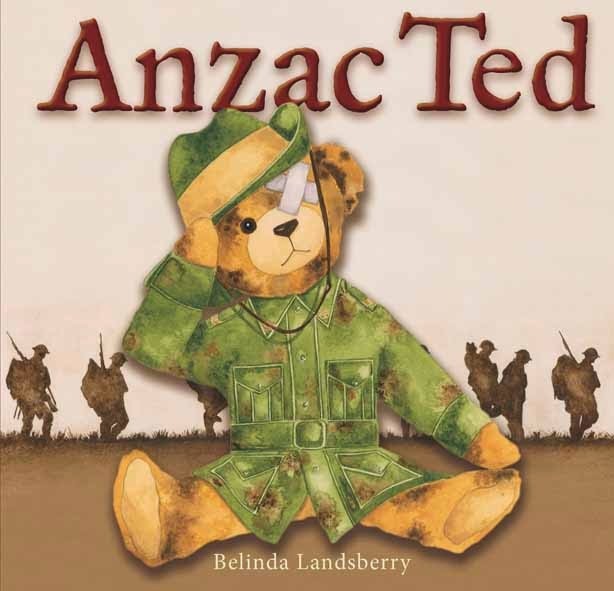 Anzac Ted was written and illustrated by Belinda Landsberry and published by Exisle Publishing, 2014. I love the idea of a book about a teddy bear that goes off to war as a mascot. Landsberry uses a natural and easy rhyme and rhythm to introduce Anzac Ted, a toy who’s dilapidated and will never win an award for his looks. But to his young owner, Anzac Ted is a hero who belonged once to his grandpa and went off to war with him. But some heroes never do. The illustrations work really well. Landsberry uses a sepia palette when showing us the past, and uses soft muted colours in the present. Children will love the detailed pictures of the teddy hero - battle-scarred, patched and missing bits. I’m sure they’ll remember their own loved Teddies, and connect to the story even more. 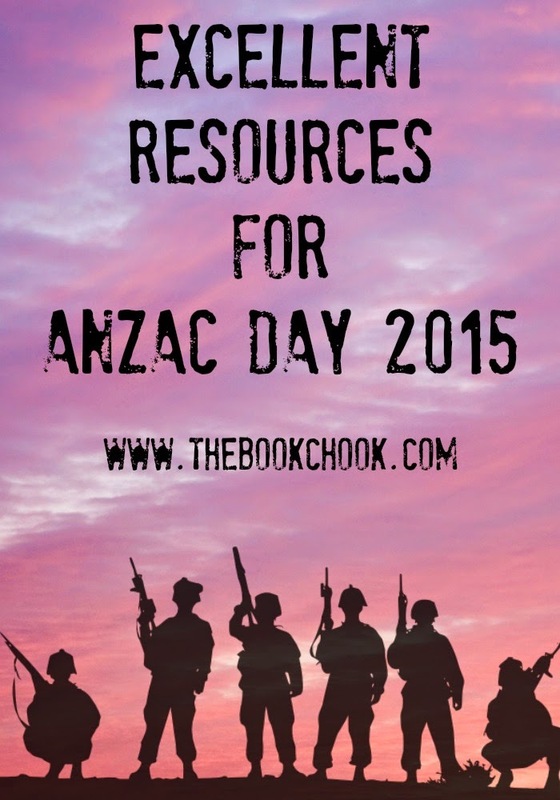 There’s also an Anzac Ted ebook available. You can hear a narrator read the book aloud at Exisle’s website. 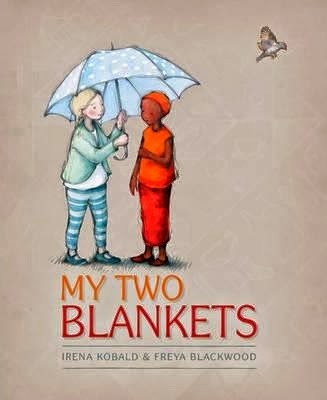 My Two Blankets was written by Irena Kobald, illustrated by Freya Blackwood, and published by Little Hare Books, an imprint of Hardie Grant Egmont, 2014. This children's picture book does not have a specific Anzac theme. Instead, it tells the story of a little girl who has been displaced by war, and her struggles to adapt to life in a new country. We begin to understand how difficult it is not to understand the language of a new country, and how friendly smiles and interest can make all the difference to a new citizen. This is a lovely positive message, and the book is suitable for many resource themes, as well as Anzac. As usual, Blackwood's illustrations are stunning - you can see several in her blog post. There are also Teacher Notes available via HGE's website. Finally, check out KBR's more detailed review, here. 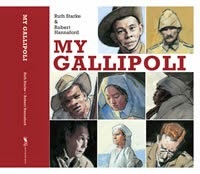 My Gallipoli was written by Ruth Starke, illustrated by Robert Hannaford, and published by Working Title Press, 2015. I found My Gallipoli almost a compulsive read. As soon as I realised that each double page spread was devoted to a different character's perspective on Gallipoli, I wanted to explore them all immediately. It's a brilliant way to help children not only find out more about Gallipoli in particular and war and the ANZACs in general, but it also opens a reader's eyes and hearts to more. We're caught up in the emotions of a range of characters, and through them we see different facets of war and its effects on everyone involved. I found myself swallowing the lump in my throat over and over. Starke's text has a refrain - This is my Gallipoli - that strengthens the book's impact, an impact heightened still more by Hanford's atmospheric art work. I think teachers and librarians will appreciate the solid research and believable characters in this children's picture book, as well as the way it encourages development of empathy and tolerance. My Gallipoli belongs to that wonderful class of books that leaves us better people for reading it. Do you think about the feats and fears of our soldiers and what they did? Do you ever think about what it was like for those on the other side of our bullets and bayonets? For, in this powerful picture book, we are encouraged to do just that, to consider what it was like both for those who made that fateful landing on the shores of Gallipoli in 1915 and those whom they were fighting against…from Year 5 up. Read more of Barbara Braxton’s review at The Bottom Shelf. Among the plethora of publications being written and released to commemorate the centenary of the events of April 25, 1915, this is a standout. By focusing on the place, Jackie brings range of perspectives about the people – the fishermen, the many nationalities who fought and those who defended. The blood that was shed mixes and mingles into a story of a battle with no heroes or winners – just people and the futility of war. Read more of Barbara Braxton’s review at The Bottom Shelf. With perfect timing as we approach the centenary commemorations of World War 1 and the Anzac legend, this new picture book in the Meet… series (which includes Ned Kelly, Saint Mary MacKillop, Captain Cook and forthcoming Douglas Mawson) has been beautifully executed with younger readers in mind. The simple but eloquent text describes the beginning of the Anzacs as young men in Australia and New Zealand enlisted and their subsequent travels and experiences leading up to Gallipoli. Read more of Sue Warren's review at Just So Stories. Simpson and his Donkey was written by Mark Greenwood and illustrated by Frané Lessac. This children’s picture book ...is not just a story about a battle. It shows us the human side of war, the courage, the waste of human life, the brotherhood engendered among men fighting for a common cause. When Jack was just a lad in England, before he sailed off to Australia and adventure, he vowed never to forget his young mate, Billy. Billy was one of more than three hundred men whom Jack rescued at Gallipoli. Read more in my review. An ANZAC Tale is a graphic picture book by Ruth Starke and Greg Holyfield. Despite the "animal" characters, this is a moving and I feel accurate account of the ANZAC story told from the perspective of an average soldier. It's obvious a great deal of research has gone into this book: the uniforms, the authentic tone of the dialogue, the sentiments expressed by the soldiers, the history revealed - even the slight deviations noted - all contribute to putting the reader right in the thick of the action. Read more in my review. The Treasure Box Are you looking for a book with themes of war and its results rather than one specific to Gallipoli? I recommend The Treasure Box, a lovely children’s picture book by Margaret Wild and Freya Blackwood. Read about it in my review. Azzi In Between is about a young refugee who is forced to leave her home and flee to a new country. It’s a graphic novel by Sarah Garland, and is ideal for helping kids realise what life is like for many people after the devastation of war. Read more in my review. Lighthouse Girl was written by Dianne Wolfer, illustrated by Brian Simmonds, and reviewed by Rebecca Newman at The Book Chook. If you're looking for a book to add to an Anzac-themed collection, this is a gentle introduction to the concept of war and the impact war had on those waiting at home. Children in middle to upper primary school will find it interesting to compare Fay's day-to-day activities with their own. Lighthouse Boy was written by Dianne Wolfer, illustrated by Brian Simmonds, and reviewed by Rebecca Newman at Soup Blog. Reading Jim’s letters is like reading letters from someone you know (your own brother, or a friend). Through Jim’s eyes we see how war affected young Australian soldiers and their horses serving in World War I, and how hard it was for friends and family left behind. Midnight by Mark Greenwood and Frané Lessac. Obviously based on meticulous research, and dedicated to the Light Horsemen and their horses, Midnight is above all a story of one man and his horse. The Charge at Beersheba is brought to life for us through the eyes of Guy Haydon and Midnight. Lessac’s striking illustrations perfectly complement Greenwood’s evocative text. My mini review is in ANZAC Day 2014. The Poppy by Andrew Plant. The Poppy makes another excellent children’s picture book for schools that need to augment their ANZAC Day resources. Although not specifically about Gallipoli, the fact that it sprang from a WW1 event and that it shows the positives that can come from conflict definitely make it qualify, in my opinion. My mini review is in ANZAC Day 2014. Australian War Memorial Activities for Students. Resources are filterable according to Australian Curriculum codes. If you are close to Canberra, there’s an excellent list of educational tours to choose from. The Last Post on Youtube. Here's an ABC article about a recording made by an ANZAC on a shellac disc, with audio included. RSL Anzac Art Awards for students of all ages. Activity Village UK printables, including the poem In Flanders Fields. Using the idea of animals in war to guide younger children to an understanding of Anzac themes via Mrs Barker's Tea Room. Great Pinterest board with TL recommended books, Remembering Gallipoli. If you've enjoyed this post, or any others at The Book Chook, I'd love you to help me spread my literacy, learning and literature ideas by promoting/sharing via Twitter, Pinterest, Facebook, StumbleUpon, G+ or any other way you decide. Later today I have five suggestions for recently published children's picture books that will help your kids celebrate Easter. Great list. Thanks for this!